This species is accepted, and its native range is NW. Venezuela to Central Ecuador. Nativa en Colombia; Alt. 1500 - 2100 m.; Andes. Terrestrial, herbaceous perennial Rhizomes to 1 cm long, 0.5-0.8 cm in diam. Roots striate, 0.3-0.5 cm in diam. Leaves lorate, 25-40 cm long, 2.5-4.3 cm wide, coriaceous; margins revolute, light green; apex obtuse, emarginate, oblique. Inflorescence a 2-4 flowered spicate raceme. Peduncle green, pilose. Floral bracts ovate-elliptic, 4.0-6.4 cm long, 1.6-4.0 cm wide, much shorter than ovary; adaxial surface sparsely pubescent with multicellular, glandular-tipped hairs; margins light green, fused basally; apex obtuse, apiculate. Sterile lower bracts usually absent; if present, like leaves. Flower yellow-green becoming maroon apically; outer surfaces glabrous to puberulent; inner surfaces mostly glabrous; margins yellow to white, somewhat undulate. Dorsal sepal ovate-lanceolate, 8-12 cm long, 1.4 - 2.5 cm wide, yellow-green with 9-11 parallel to somewhat reticulate maroon nerves, glabrous; margins undulate; apex acuminate, minutely hooded. Synsepal ovate-lanceolate, 8-10 cm long, 1.5-3.5 cm wide, yellow-green with 14-17 parallel maroon nerves; margins undulate, white to yellow; apex minutely hooded. Labellum ovate-lanceolate, not saccate, 23-41 cm long, 1.0-1.5 cm wide, like lateral petals. Petals lanceolate, 18-41 cm long, 0.5-1.3 cm wide, yellow-green; inner surface glabrous basally, both surfaces becoming pilose-tomentose apically; basal hairs reddish-brown; margins ciliate basally; apex acute. Staminode widely trilobed-triangular, 0.5-0.8 cm long, 0.9 - 1.2 cm wide, yellow-green with maroon lateral lobes; apical lobe widely acute; hairs on lateral lobes sparse, marginal, multicellular, dark red. Column to 0.5 cm long, green with red splotch above. Pollinarium 0.2-0.3 cm long. Median stamen to 0.5 cm long, contacting stigmatic surface. Stigmatic area 0.5-0.7 cm wide. Ovary, including pedicel, 12-18 cm long, densely pilose. Capsule puberulent-pilose, curving apically. Seeds to 0.7 mm long. Chromosome number 2n=28 (Karasawa, 1980). Phragmipedium lindenii occurs as a terrestrial on road embankments and in lava fields at 1400-2100 m in elevation. Paphiopedilum lindenii (Lindl.) V.A.Albert & Börge Pett. Villafuente Arriaga, M. & Christenson, E. (2007). 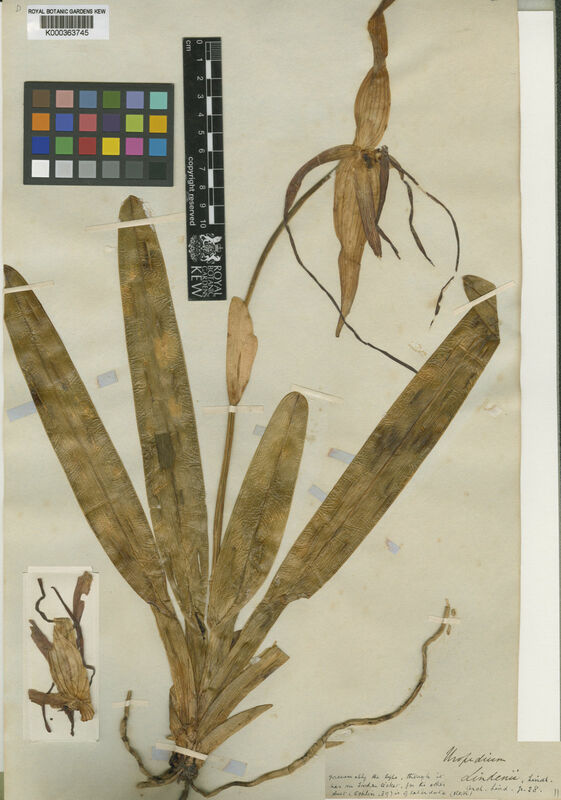 A dramatic range extension for Phragmipedium lindenii Orchid Digest 71: 41-42. Braem, G.J., Ohlund, S. & Quené, R.-J. (2004). The Real Phragmipedium warszewiczianum. A Clarification of the Phragmipedium caudatum Complex (Phragmipedium section Phragmipedium) Orquideología 23: 117-136. Lindley, J. Original description of Phragmipedium lindenii. 24, (1975).